I was born in 1977 and grew up with my parents and two younger sisters in Stapleford. Upon leaving school at 16 I started my first job as a chambermaid and un-be knowing to me at the time met a good friend who would later become my husband. In 1994 I pursued my love of cooking and studied at Clarendon College doing a GNVQ in Hospitality & Catering followed by an HND in Hotel & Catering Management at Nottingham Trent University. I worked alongside my studies at Nottingham/Derby Posthouse, enjoyed working as a chef/waitress & chambermaid. From university, I moved on to Thistle Hotels Leeds where I joined a trainee management program. I moved back to Nottingham in 1998 working as a Bar / Reception Manager at Bestwood Lodge Hotel, married my best friend in 2000, had a career change in 2003 working at a car dealership. We became parents in 2004 and decided to both try something new "working for ourselves", so since August 2004 I have worked alongside my husband in his Bedroom, Bathroom & Kitchen fitting business. Now being a busy Mum to three young children I have decided to expand my hobby. My love of catering dragged me back but this time to cakes, after enjoying and becoming more adventurous doing birthday cakes for family & friends, I have gained a qualification a PME Professional Diploma in sugar paste, Royal Icing & Sugar Flowers. 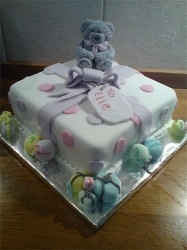 Being fully qualified and having several years of practice, I aim to provide as many clients as possible with bespoke cake baking and decorating throughout Nottingham. You can view a portfolio of some of my previous works on the Gallery page. Find out more about me and the amazing cakes that I can provide for every event or just for fun. 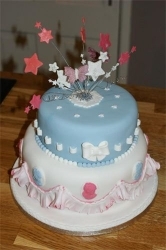 My cakes will always be bespoke to your requirements so call today on 01332 725058 or 07971 106328.